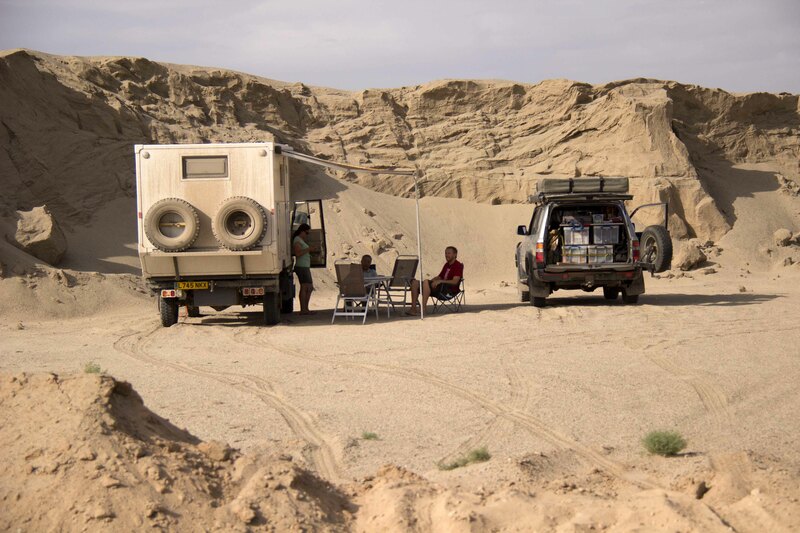 We awoke at the Lunnanzhen campsite, next to the river Tarim. Jon cooked us up a New Zealand breakfast favourite of fried bread with honey, just like his grandma used to fuel him up with. We were soon on our way once more, and it was only a few hundred km to the town of Kurle where we would stay for the night. Once we arrived, we took the chance to stock up on supplies at a supermarket – it was as interesting an experience as any sightseeing. Shelves of chicken feet, yak meat, and vegetables of the strangest forms. The area dedicated to rice and soy sauce was impressive to say the least. The hotel parking was limited, and right on a main street with a police hut just across from us. The lights flashed all night, which when combined with the regular sounding of car horns made for a pretty inconsistent night’s sleep. 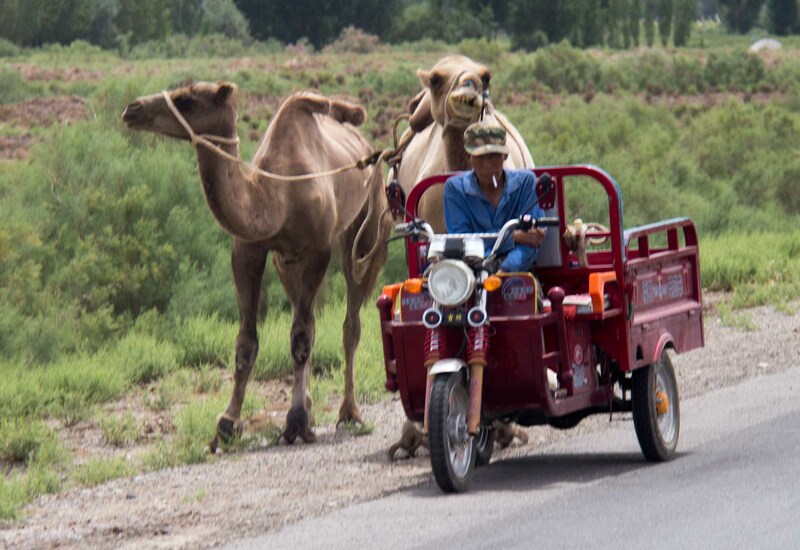 An easy drive again, a few hundred km – that involved crossing the foothills of the Tien Shan mountains, just as they first rise out of the desert. We dropped down the other side into Turpan. The atmosphere in the town was on edge, it was clear just from walking around. Two days previously intense rioting had resulted in 27 dead. Protesters had stormed a police station, a local government building, and a construction site. It was part of a long going dispute between the native Muslim population and the Han Chinese authorities. The reasons are too complex to recall here in full, but suffice it to say the Xinjiang locals do not consider themselves to be part of China as a whole and reject being controlled by Beijing, whereas the Chinese Han authorities who took occupancy of the area some 50 years ago, and who have recently discovered a wealth of natural resources beneath its earth, are inclined to disagree. We’d been assured by Lun that it was safe for us, but there was a distinct feeling of unrest. 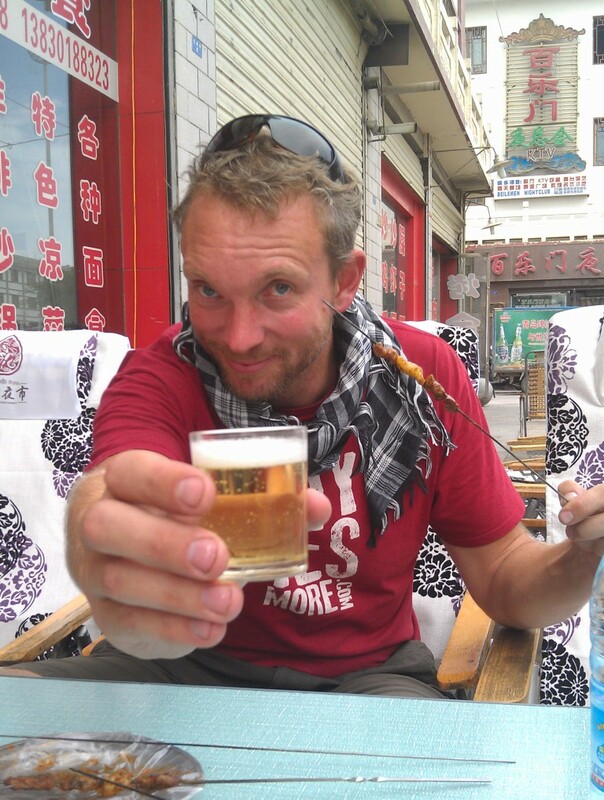 To go through China with your own vehicle you need a guide – China, as we have noted, is really rather big – so it takes quite a while to get across. Therefore you hire a guide for ages and it starts to look pretty pricey. If you can assemble a group, as we did via travel forums, then you can split the cost of the guide and save some pennies. A group of motorcyclists on their own would also have to hire a car and driver for the duration of the trip – so it pays for them to try and get car drivers on board to carry the guide, and save yet more cash. You can see where we fit into this little arrangement. But to win us over, and join the group one of the conditions was that we would be getting into the countryside for 12 nights out of the 35 for some camping – and to prevent us from simply hopping between towns, and therefore staying in an endless string of hotel car parks. And to surmise the debate, as we saw it – Lun had informed us that we would be arriving soon at some sensitive areas in China, where the local police would be insistent that the whole group stayed in the same place. A collection of our two wheeled comrades changed their mind overnight about the camping part of the trip, sighting reasons of the climate being too hot / cold / wet / dry for the rest of our time in China, and basically decided to ignore any agreement we had once made and adjust the itinerary that we had all signed up to as it suited them. Now, we are generally not very keen on being drawn into arguments and the like, but we were left with the strong feeling that they had just said what we wanted to hear to get us on the trip to save them a load of money, and then done what they wanted anyway…. We won’t dwell on it, for fear of the blog entry transforming into a transcript of a particularly petty ‘big brother’ episode – but suffice it to say a rift was put in place that would never truly dissolve for the remainder of the tour. Outnumbered, our cause was lost, and we resolved to make the best of it where we could. We sloped off to find some street eats, and managed to find a café owned by naughty Muslims that were prepared to sell us cold beer, but only if they delivered it to our table in a large tea pot, and we drank it from tiny tea cups to keep up the façade – the ridiculousness of this went some way to cheering us up again. Playing the sulky teenager card a little after the night before, we kept our distance from the offending bikers as we toured around some of the local sights on a wee bus organised by Lun so that we could see as much as possible. First stop was a museum that showed how the area had been receiving its water for the last 1500 years or so – being miles from any river, receiving only 200mm of rainfall each year, and with the evaporation in the 45 degree heat of over 3000mm of water, this would be a challenge. A museum on irrigation would not normally stir too much interest, but it was pretty impressive all said and done. The ingenious ancient inhabitants had taken to digging underground channels, all the way from springs and underground rivers in the Tien Shan mountains, to make sure that the precious water would not evaporate. These karez, as they are known, would stretch up to 100km long, were up to 100m deep at the source, and managed to maintain a constant gradient to the deliver the water to where it was needed. Not bad when all they had to work with were primitive tools made from wood, stone, and rope. This area of China had over 5000km of these channels manually made and they are considered to be one of China’s great ancient achievements, with similar adoration as the Great Wall. Though the Chinese were not pioneers in the field, having thieved the idea from the Persian and Turcoman peoples, they did develop the most expansive network by far. 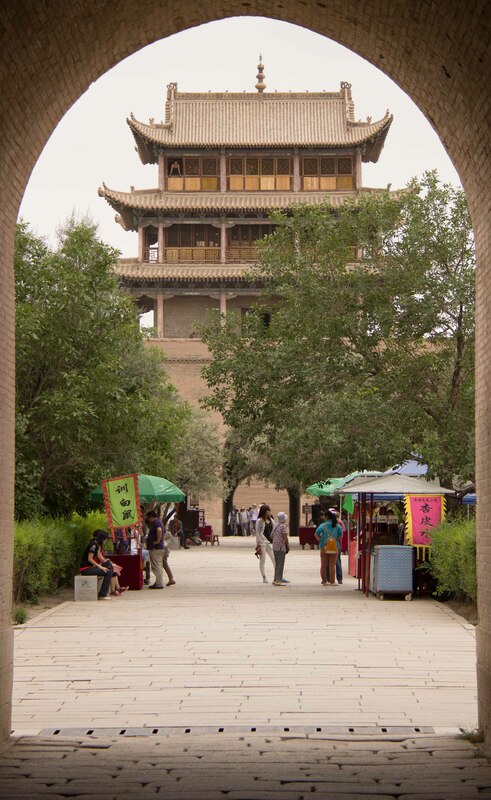 Next stop was the Ancient city of Jiaohe – a massive city in its era that formed an important stop along the silk roads. With origins as far back as the second century, the city was populated up until the 14th. Many of the original walls of the buildings are still intact, and it made for a fascinating walk around – we stayed close to Lun who had picked up a lot of knowledge of the venue from his numerous visits. The midday sun was now fully upon us, so we retired back to Turpan. The last stop was supposed to be the town museum – but the guy on the door was a stickler for the rules and wouldn’t let either of us in because we were wearing flip flops! Only in China do you get allowed in night-clubs wearing whatever you want, only to be turned away from a museum a few days later for your footwear. 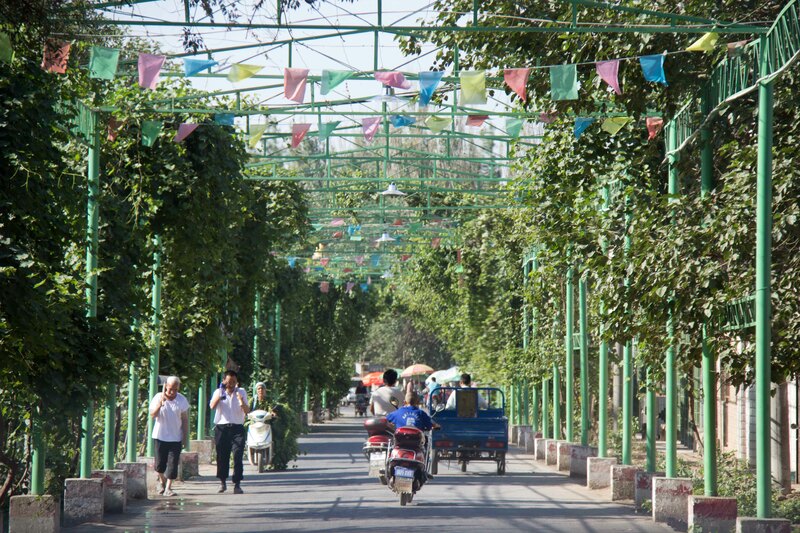 We were happy to be leaving the tensions of Turpan behind us – and would be heading out across the lower edge of the Gobi desert towards the town of Hami. 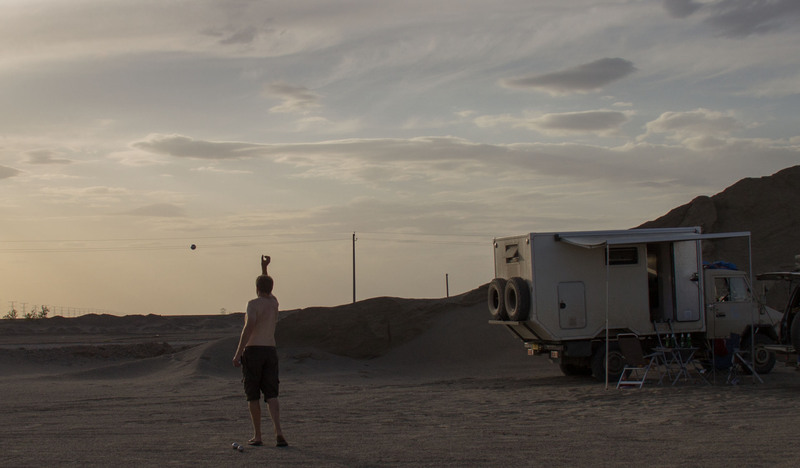 Since we were still in the Xinjiang province, Lun said that it would be okay to camp outside of the town where the softy bikers would be tucked up in their hotel, so after stopping in at Hami for some provisions we took a random side road that lead into the desert. We found a perfect spot to park up that night, with a large bank to protect us from the sun / wind, and a big flat area that would make an ideal games arena – it just needed a little spade work so that we could get the trucks through a ditch and over a ridge into it. Jon made the first attempt at getting in, and planed a fair amount of the ground flat with the underbelly of his land-cruiser, but not quite enough to get through. A little more digging and we were through. We had a break mid game so that Kim could set about making our first test call with the satellite telephone that we had brought with us, so that she could wish her sister Jenny a happy birthday. But even with this extra rest, New Zealand won disappointingly easily. With bowling skills left over from playing a similar game in his youth, Jon gave us a damn good thrashing. We consoled ourselves with the stunning sunset, and a cloudless sky for a little star gazing far away from any serious light pollution. After a nice drive through the remainder of the Gobi desert, we parted with an au revoir knowing that we would be traversing the northern edge when we pass back through Mongolia in May 2014, all going to plan. We finished our drive for the day at the tourist town of Dunhuang. We had some chores to do in the afternoon – laundry and other such excitement, which kept us busy for a few hours. The evening was upon us before too long, we had a quick beer out in town and then ate in the night food market. We dined on a disappointing local specialty that turned out to be a dark green mush, but we paid pittance for it. Up until now in China we’d ordered a surprising amount of dishes without yet picking a dud, so it was long overdue. The Mogao caves of a thousand Buddha’s awaited us today. It seems they were rounding down when they did the Buddha inventory, for there are in fact hundreds of caves – and all of those that had been designated as prayer rooms had pictures and statues of the Buddhist leader gracing every surface available to them. These figures feature heavily in the artwork of the region – they are the bringers of joy, and can be seen dancing with their instruments on plinths at many an intersection. 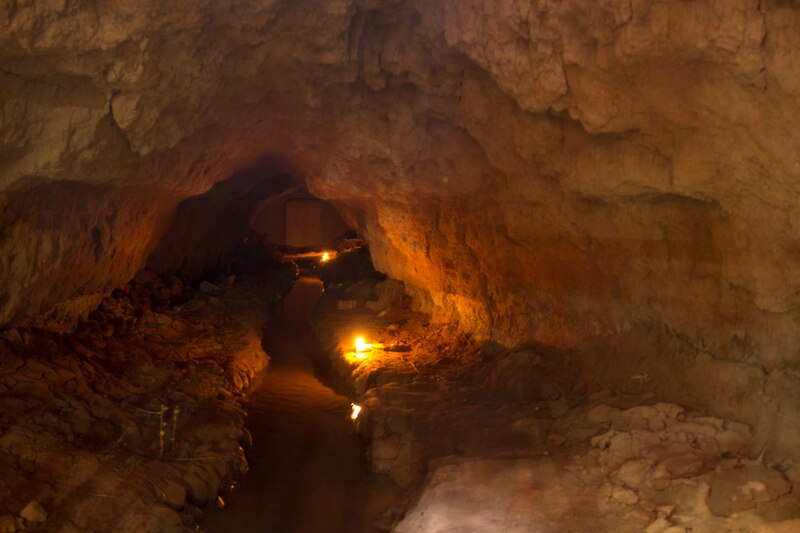 The first scrapings of these man-made caves were made as early as 330A.D. during the Former Qin Dynasty, and over the last few hundred years they have been steadily ‘discovered’ by us western folk – who pillaged and sold off what they could until the locals put a stop to it early in the 20th century. Today the site is protected by Unesco, so no more artefacts should be finding their way to the archives of our national museums. We were lead around the impressive site by an English speaking guide, but were only permitted to see 10 chambers since they are trying to ensure minimal impact of UV light on the decorations that are within. Some of the paintings give an interesting insight into the formations of the religions in the region, as different aspects from different religions, such as Taoism, Hinduism, and the Tibetan forms of Buddhism have been brought together as travellers have passed through the region. By the time we left the caves the midday heat was in full force, but we still had to spend some time outside swapping Ivor’s tyres around, which were beginning to wear a little unevenly at the front. Once that was out of the way we spent a lazy afternoon before heading once again to the food market, and this time discovering a local delicacy that was far more appetizing than that of the previous evening; a Chinese burger! Some meat fried up together with plenty of garlic and coriander and then served up in a flat-bread. A whole lot more appealing than the cuts of donkey that were available elsewhere in the market! 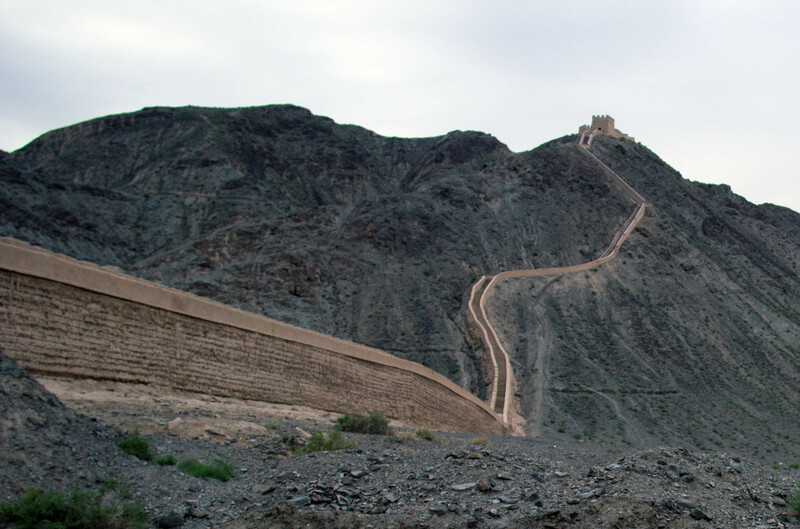 We would make the long drive to Jiayuguan today – from which the Great Wall spreads east. We traversed the distance with ease, and arrived in plenty of time to have a look around the fortress that, in ancient times had formed the Western gateway between the Chinese territories and the wilderness that lay beyond. For travellers headed west along the silk road this was the last civilization they would see, apart from the isolated towns controlled by the Khans of old, until the areas we know today as Russia or Azerbaijan. In fact, if you had a major disagreement with the powers that be back in the day, it was from this gate that you would be cast – forced to spend the rest of your days amongst the deserts and bandits that awaited you. While at the fortress we enjoyed a choreographed display of Chinese martial arts and weaponry – although it was a little cringeworthy to have such a show laid on for the tourists, the skill of the performers was unarguably impressive. Having fully accepted our roles as the silly tourists, we even tried our hands at archery in the courtyard – suspecting the whole time that the stand was really intended for children. A couple of hours touring the site was enough, before we went off to find the spot where Lun said we could camp right next to the Great Wall – in an area where strands of it broke away from the flat desert plains and head up into the mountains. Lun had said that once again, since the precious bikers would not be far away then the authorities would allow the group to be divided – actually one of the precious two wheelers even broke ranks and slummed it with us 4×4 drivers for a change. While we had been enjoying ourselves seeing the sights, Jon had been struggling with a very different afternoon. What had started out as a routine seal fix on the differential of his truck (AKA Boris), the mechanic had uncovered a broken rear spring – something a whole lot more serious than an occasional oil top up. By the time we arrived at the agreed camping area, Jon was already deeply involved in problem solving – the Russian way. Half a bottle of transparent ‘fixing-fluid’ was gone already, and it is fair to say Jon’s spirits were on the up. By the time night fell we had decided to take our sleeping bags, hike along the wall, and spend the night under the stars. We wouldn’t want to embarrass Jon by stating just how far his unique brand of problem solving went – but we’ll just say that despite the empty bottles, and some amusing photographs of an underdressed Kiwi on a world famous ancient landmark, Boris – like Jon – would still be broken in the morning. He would have to drive carefully until it could be fixed properly, and perhaps turn the stereo up on bumpy roads if he wished to ignore the grating noise from the rear of his vehicle.